Ronald B. Tobias details these 20 time-tested plots. Each is discussed and analyzed, illustrating how a successful plot integrates all the elements of a story. Tobias then shows you how to use these plots effectively in your own work. Give your story a solid foundation—a plot that engages readers from start to finish! The best stories linger in the hearts and minds of readers for decades. These tales gain their power through plots that connect with the audience on both an emotional and intellectual level. Tobias then goes to the next level, showing you how to choose and develop plot in fiction. 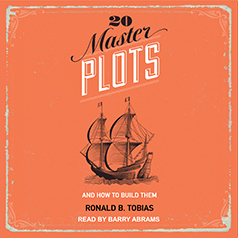 He shows you how to craft plot for any subject matter, so that you develop your work evenly and effectively. As a result, your fiction will be more cohesive and convincing, making your story unforgettable for readers everywhere.